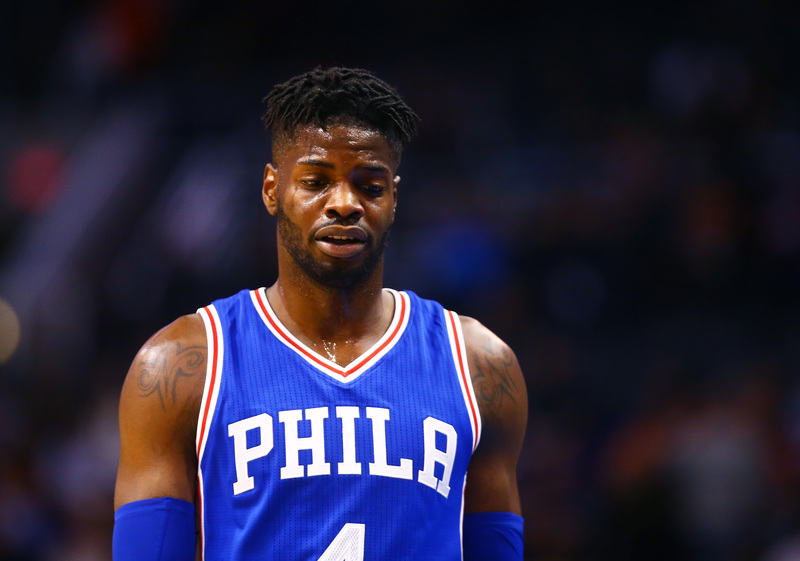 Once considered a potential No.1 overall pick, Nerlens Noel has somewhat fallen off the radar this season for the Philadelphia 76ers. Here is a list of the most likely suitors for his services. 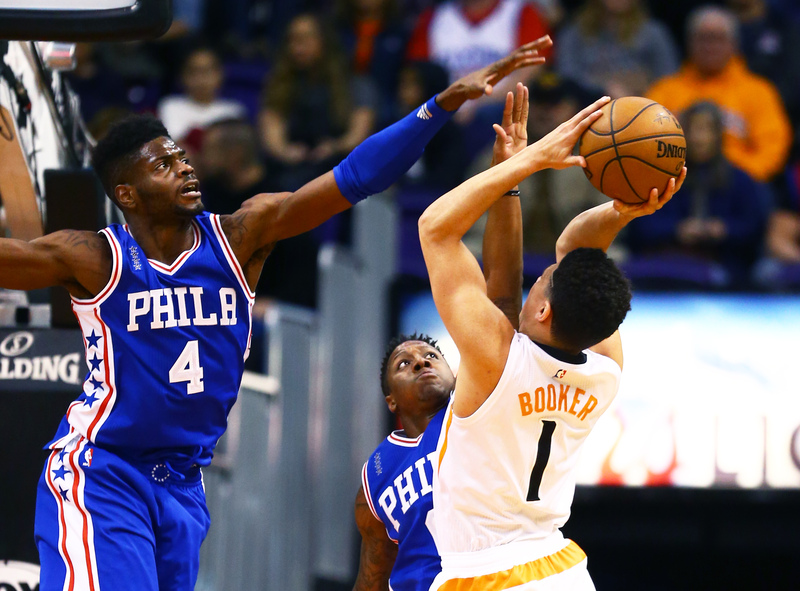 Not much has gone as planned in recent years for Nerlens Noel. Predicted to be the No.1 overall pick in his draft, Noel played just 24 games in sole season for Kentucky before tearing his ACL. Despite the devastation nature of the injury, many believed this wouldn’t hinder dramatically Noel’s prospects in the 2013 draft. As we are well aware, Noel slid all way to No.6 overall, where he was snapped up by the Philadelphia 76ers in a draft day trade. The knee injury forced Noel to miss the entire 2013-14 season, further compounding the pain of his draft stock diving so dramatically. To make matters even more difficult for Noel, the Sixers drafted big men with their lottery selections in the next two drafts. In 2014, the Sixers selected Joel Embiid with the No.3 overall pick and in 2015, they selected Jahlil Okafor with the third overall pick. As has been well documented, these selections were made by the then president of basketball operations, Sam Hinkie. With his era dubbed “The Process”, Hinkie was simply selecting what he considered the best available talent at each draft. 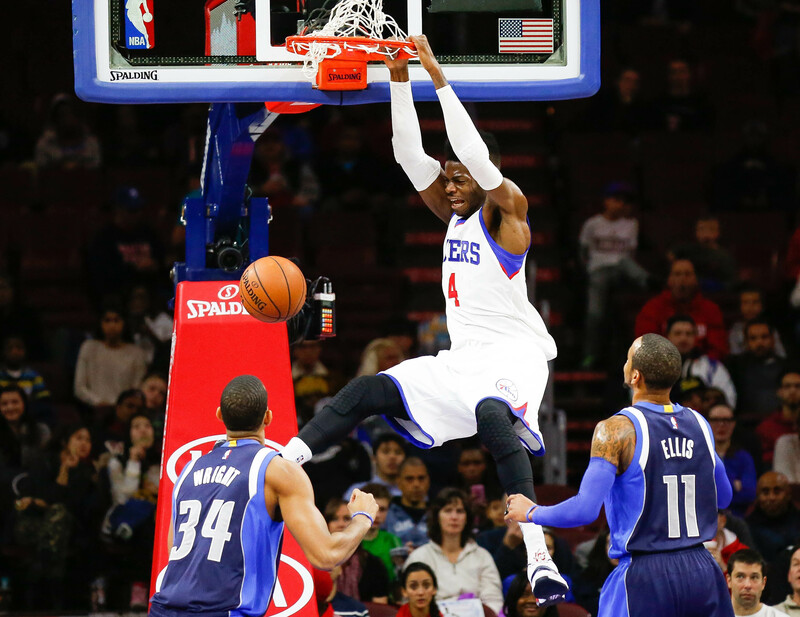 Therefore, selecting three players 6-foot-11 or taller was not obstacle for Hinkie. It was a matter of gathering assets to use down the line. 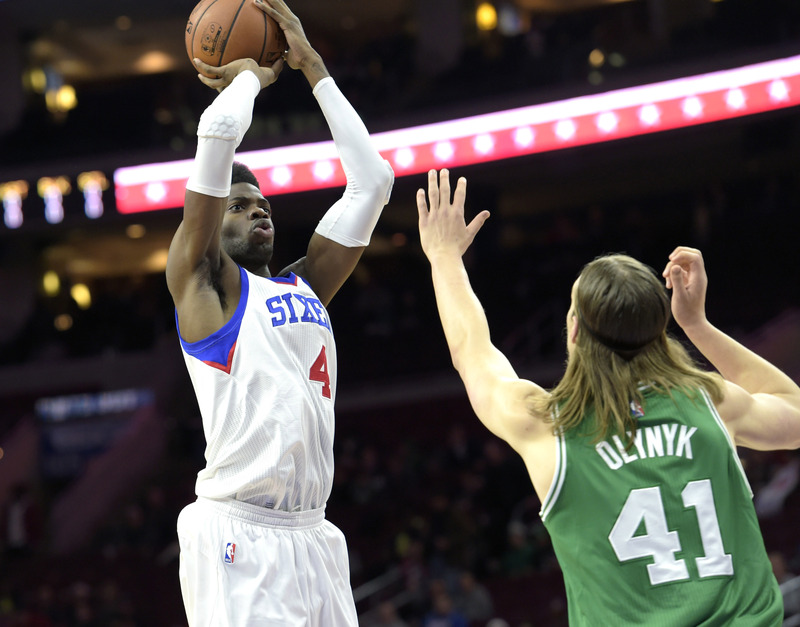 The problem for Noel is that “The Process” has caught up with him and his career. In his first two seasons, Noel showed steady progress and teamed up last season with Okafor in latter’s rookie season. But with the emergence of Embiid this season after returning from two years on the sidelines has pushed Noel back in the pecking order. Already, fellow big man Okafor looks set to move as he was forced to sit a recent victory over the Miami Heat due to a potential trade being agreed upon. Noel himself has the been the subject of much speculation, without any definitive news one way or the other. 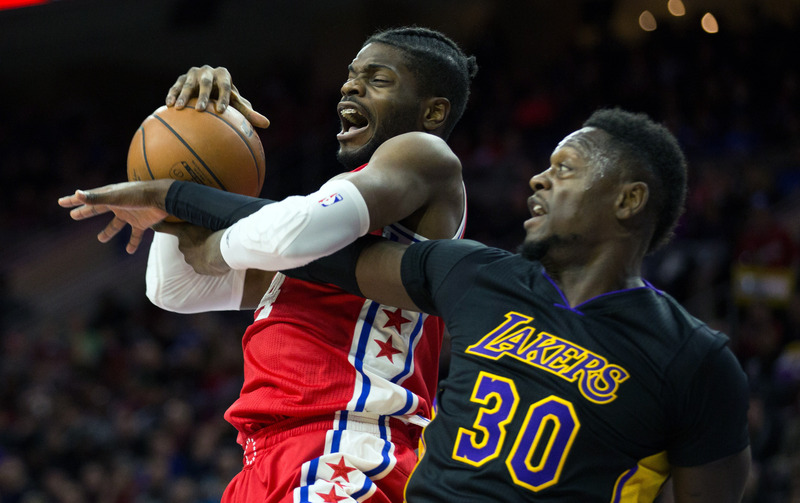 But with his rookie contract coming up at the end of this season, the Sixers will need to look quickly to move Noel if they aren’t planning on signing him to an extension this offseason. Here are a list of the five most likely potential suitors for Noel. Currently, the Bulls are a team headed nowhere. They have a resident superstar in Jimmy Butler, but the makeup of the rest of the team makes little to no sense. Dwyane Wade is now 35 with another year left on his deal. Rajon Rondo is making $15 million as a one-year rental. And there are younger players such as Doug McDermott, Nikola Mirotic and Bobby Portis who, for one reason or another, have not broken out yet. Bringing in the 22-year-old Noel could represent part of a complete tear down of the Bulls’ current roster. Incumbent center Robin Lopez is a solid player and is still just 28 years of age. But he is now on his fifth team in his ninth year in the league and is clearly not the future for the Bulls in the middle. If the Bulls are really intent on backing head coach Fred Hoiberg and his preferred up-tempo style, Noel fits the bill perfectly. A restricted free agent at the end of the season and with plenty off room to grow, trading for Noel would be an extremely low-risk, high-reward move. With the Sixers in need of perimeter shooting, a straight swap for McDermott could represent a great deal for players and franchises alike. Each player will be receiving a fresh start and the full backing of the coaching staff. In the meantime, the Bulls would need to find an alternate home for Lopez and his $13.2 million per year contract. Click here to see how the Noel-McDermott deal would pan out. The Phoenix Suns make a lot of sense for both parties. The Suns have a dynamic backcourt in Eric Bledsoe and Devin Booker. They have some developing frontcourt players in Alex Len, Marquese Chriss and T.J. Warren. And most of all, starting center Tyson Chandler is 34 and unlikely to remain a starter for much longer. Injecting Noel into the mix of young and up-and-coming players would be a boost for a team struggling to find their form and an identity. Still just 22 years of age, the Suns could potentially score a bargain by acquiring Noel before the Feb. 23 deadline. 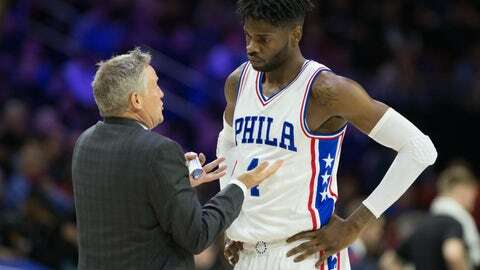 Considering he is a restricted free agent come the end of the season, the Sixers will be well aware that their bargaining power is limited considering the noises surrounding their potential moves of late. If a deal were to be made, a third team would likely have to come into the equation. Alex Len, the player taken by the Suns with the pick immediately before Noel in 2013, would be the logical trading chip. But Len is in a similar situation — struggling for playing time and most likely wanting to look for a better situation. And the Sixers have no real desire to pay someone like Len to be a permanent backup. Click here to see how a three-team could out to ensure Noel landed in Phoenix. A team already stacked with young talent, Noel would be a terrific fit in the middle as the Los Angeles Lakers look to build for the future. Last offseason saw the Lakers invest heavily to their big man stocks, signing free-agent center Timofey Mozgov to a four-year, $64 million deal. At the time this seemed like a hefty price to pay. And now, it looks even more skeptical. The past three games has seen Mozgov receive the dreaded Did Not Play-Coach’s Decision. Not exactly what you’re expecting from someone earning $16 million per year. Like the Suns’ situation, it is highly likely the Sixers would need to find a third party interested in Mozgov in order to facilitate a deal. These sentiments certainly describe Noel’s best attributes. With all due respect to Black, Noel is clearly the more talented player. Whereas Noel was a likely No.1 overall pick prior to his knee injury, Black was undrafted and is just 6-foot-9 playing center. Adding Noel for the Lakers at this stage would be a bargain. Granted, it’s likely if they were to find a taker for Mozgov that they would have to give up a little extra themselves. That may entail them taking on a bad contract themselves or parting way with a future draft pick and players. But at just 22, Noel, along with Brandon Ingram, D’Angelo Russell and Julius Randle could form the makings of future Lakers’ playoff teams. In recent years, the Dallas Mavericks have had little luck in acquiring the big-name center for which they’ve longed. First there was the pursuit of Dwight Howard in 2013. Then there was the infamous and ultimately unsuccessful chase of DeAndre Jordan in 2015. Last summer, however, saw them score the services of veteran Andrew Bogut in a trade with the Golden State Warriors. Granted Bogut is a proven veteran, and a key component of the Warriors making consecutive trips to the Finals. But staying on the court has not been his strong suit, with this repeating itself again in Dallas this season. Bogut has appeared in just 25 of the Mavericks’ 55 games this season. A free agent at the end of the season, it’s extremely unlikely that Bogut will remain in Dallas past his present contract. Therefore, taking a flyer on Noel for the final stretch of the season seems a wise for the Mavericks. Veteran center Tyson Chandler, now with the Phoenix Suns, excelled during his short stint in Dallas, and was a key component to them winning their first NBA title in 2011. Noel exhibits many of the traits that have led Chandler having a sustained NBA career. His athleticism, rebounding, shot blocking prowess and also his ability to roll to the rim would be a tremendous fit in Rick Carlisle‘s system. With a glut of perimeter players, and a lack of a genuine center aside from Bogut, the Mavericks would be wise to roll the dice and take a chance on a player with immense potential. Click here to see how a potential deal to Dallas would pan out. This makes sense for a number of reasons. Currently the Celtics rank 27th in league in rebounding. They’re 19th in defensive rating, allowing 106.2 points per 100 possessions. Also, they are 23rd in the league in blocked shots. Without a true pivot man, and with the newly added Al Horford certainly not the strongest player on the glass, this area of the Celtics’ game is in need of some refinement. "We're not? Did a team drop out of the league?" The Celtics start primarily with Amir Johnson at the center spot, but he averages just 19.9 minutes per game. Per 36 minutes, Johnson averages just 8.3 rebounds per game. Horford averages just 7.3 boards per 36 minutes. Kelly Olynyk is the Celtics’ primary option off the bench at the 5, but even he averages just 8.0 boards per 36 minutes. For the season, Noel is averaging just 19.0 minutes per game, and 9.1 rebounds per 36 minutes. Noel missed the first 23 games of the season due to a knee injury and has found his playing time to be sporadic, primarily due to the emergence of Joel Embiid. With the Celtics in need of both defensive rebounding and a rim protector, Noel’s ability and potential would be a terrific match for the playoff bound Celtics. Possessing great depth in the back court, a straight swap for guard Marcus Smart should certainly be something that both teams seriously consider. Taken with the sixth pick in the 2014 draft, Smart’s tenacity and defensive prowess would be a great fit for coach Brown and the Sixers. Click here to see how this deal would pan out. Like his fellow big man in Jahlil Okafor, Noel simply needs to find a new home. 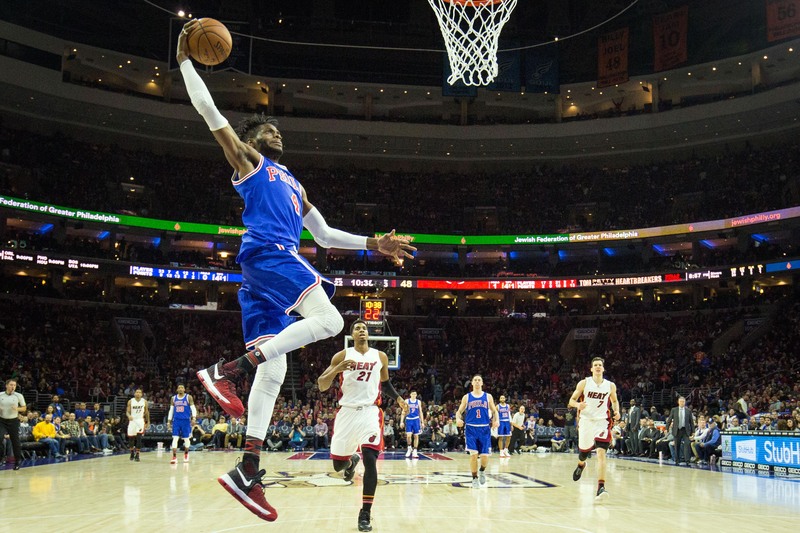 Despite the injury worries, the Sixers are well aware of what they have discovered in Embiid. With the potential to become one of the best players in the game, Noel unfortunately has become a casualty of what is simply a ruthless industry. No one could have foreseen Noel being used as an after thought midway through his solitary year with the Kentucky. Projected to be the No.1 pick, a shocking knee injury turned everything on its head. Now four years later, Noel is desperate to find a city that he can call home. In an era where a lot of teams will use just the one big surrounded by a bunch of shooters, finding the right franchise and the fit will be crucial for Noel’s future. However, he is still just 22 and is still more or less a novice in the pro game. The Celtics would seemingly be the best, for both Noel and the team. With a fantastic head coach in Brad Stevens and an extremely selfless group, Noel would be provided a great opportunity. Not only to grow, but to learn. For potential suitors, the following clip should erase a lot of doubts surrounding his current physical condition. 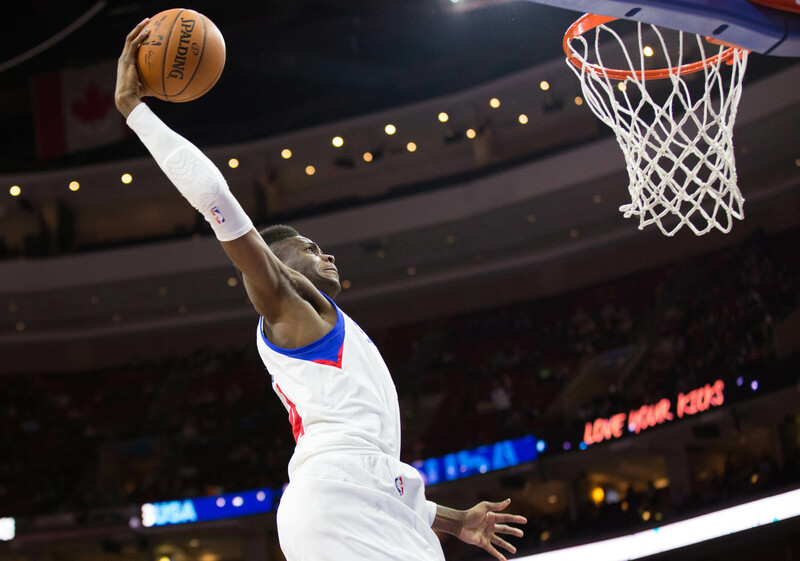 Nerlens Noel with the reverse slam! Well overdue for a change in fortune, we will find out in the coming weeks if Noel can find a place he can call home.